The cloth coverings we offer allow the parents to wrap the baby while in the vessel. 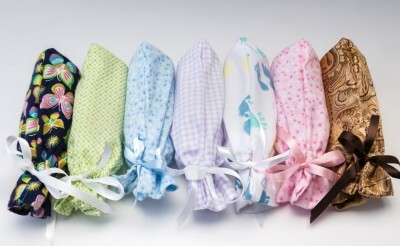 This provides a safe comfortable way for the parents to cuddle their child without harming their baby’s fragile skin. We provide cloth coverings that are sized to cover the vessel. If your interior is white, you may choose a fabric covering bag for your baby who is less than 20 weeks gestation. In the case of a D & C or a D & E, sometimes the baby is not completely intact. Not all people are able to view the remains of a miscarried child, therefore requiring a covering. When he was floating in the soluntion, I could see his little fingers and toes. They moved a bit as the water flowed between them. It was so much easier to see the details when he was in the water.